Late 1915 the German army air service introduced what could be called ground support units. Proving effective on a small scale during the Battle of Verdun in early 1916, a high priority expansion programme began. 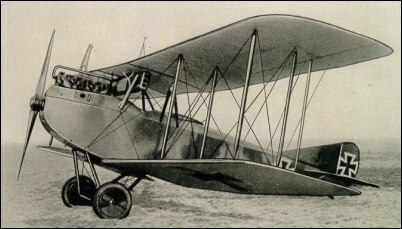 The AEG J.I was developed to meet this task until more suitable aircraft became available. The J.I was essentially a C.IV with a more powerful Benz Bz.IV of 200 hp to offset the weight of 860 lb 390 kg) of armour plate crew and engine protection. This 2 in (51mm) thick steel sheet protection extended from the nose to the rear of the cockpit. Armament was 2 LMG 08/15 mounted in the rear cockpit floor pointing downward and forward at about 45 degrees. These could be used to strafe trenches or columns of troops. The observer had also a trainable LMG 14 on a ring mounting. The increased weight caused ailerons to be added to the lower wings to improve lateral control. AEG built more than 600 J.Is and J.IIs.